Late on a hot summer night in 1965, Charlie Bucktin, a precocious and bookish boy of thirteen, is startled by an urgent knock on the window of his sleep-out. His visitor is Jasper Jones, an outcast in the regional mining town of Corrigan. Rebellious, mixed-race and solitary, Jasper is a distant figure of danger and intrigue for Charlie. So when Jasper begs for his help, Charlie eagerly steals into the night by his side, terribly afraid but desperate to impress. Jasper takes him to his secret glade in the bush, and it’s here that Charlie bears witness to Jasper’s horrible discovery. With his secret like a brick in his belly, Charlie is pushed and pulled by a town closing in on itself in fear and suspicion as he locks horns with his tempestuous mother; falls nervously in love and battles to keep a lid on his zealous best friend, Jeffrey Lu. And in vainly attempting to restore the parts that have been shaken loose, Charlie learns to discern the truth from the myth, and why white lies creep like a curse. 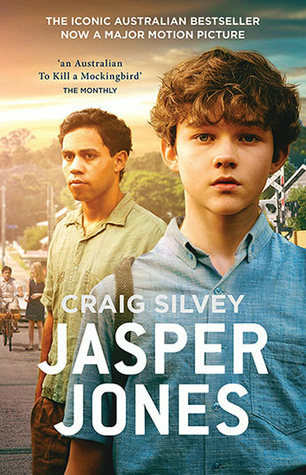 Jasper Jones is currently screening in Australian movie theatres. Before I go and see it, I thought I should read the book (since I almost always prefer the book a movie is based on). I’ll be honest, I hadn’t seen, read, or heard much about Jasper Jones, only that it was a great book. So without really knowing what I was in for, I started to read. The novel opens with a great hook – a mystery which Charlie find himself inexplicably involved and left with a secret so big it changes his perceptions of the people around him as well as himself as he tries to understand what happened. Charlie is young, conflicted, and quickly learns his world is harsher than he thought. We get to learn the other characters around him through his relationship with them, although the number of characters in this book is limited and the title character of Jasper himself remains much of a mystery. The setting of Corrigan is probably quite typical of many country towns of the time and makes a great backdrop for the story. It did give a good insight into regional Australia’s mindset regarding the Vietnam War without going into extensive detail. In many ways, the sleepy setting is somewhat reflected in the slower pace the book takes after the initial hook. That’s not to say I was disinterested, because I wasn’t, but there was a level of urgency missing. The resolution was both satisfying and frustrating (it’s hard to explain unless you read it, and I’m not about to give the ending away). This was an easy read and highly recommended. I look forward to seeing it play out on the big screen and how closely to the source material the movie stays.